If you look at this blog site, you'll notice the number of posts has gone down in the last year, particularly the last few months. It's not from lack of desire to write and share; it is from changing patterns. As part of my morning routine, I drive Dylan to the downtown bus stop to catch his ride up to Westwood. Last year, the drop off happened at about 7:25. This year, it shifted 15 minutes earlier. That 15 minutes makes all the difference in the world. On the one hand, I get about 30 minutes of quiet at work to start my day. On the home side, I have 15 less minutes to write my blog. For the last 10 years or so, I always began my day by gleaning through the digital edition of the Fort McMurray Today. They recently announced that they were no longer able to be a daily paper and have scaled back to a Tuesday and Friday publication, with a new offering called Fort McMurray This Week on Thursdays. That part of my pattern has been largely disrupted. Yesterday we read that the Fort McMurray Connect, our weekly community newspaper, will cease operations later this month. The changing patterns of society as a whole has made it increasingly difficult to make a go of it in the newspaper business. Who buys a paper anymore? Being aware of patterns or being able to recognize when one has been affected, increases one's ability to respond and adapt. In many cases, our patterns are our foundation and our folly. Good patterns provide a sense of place, personality and purpose. Bad patterns cause trouble, and over time can lead to all kinds of issues. We were talking about my eating patterns at work the other day. I eat relatively well and healthy, but there are a few patterns that have been established that I need to disrupt. I am aware of it, but not fully convinced I'm ready to shake things up. Maybe it's the holiday season, or maybe my dietary habits - good and bad - are my comfort? I don't know. 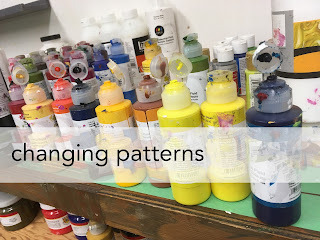 What are your patterns, both good and bad? Are you aware of all of them? Are there some that you know you need to change but are just waiting for the inspiration and motivation to do so? At the end of the day, changing a pattern can change a life. "It's the small things, done consistently, that make the biggest difference," said Robin Sharma. I think he hit the nail on the head.